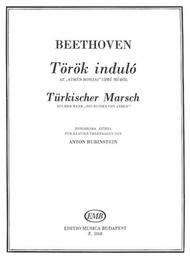 Turkish March composed by Ludwig van Beethoven (1770-1827). Arranged by Anton Rubenstein. For Piano. EMB. 5 pages. Editio Musica Budapest #Z2868. Published by Editio Musica Budapest (HL.50511240). 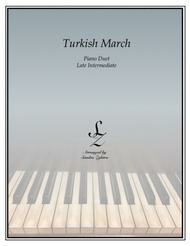 Turkish March composed by Wolfgang Amadeus Mozart (1756-1791). Arranged by Sandra Zylstra. For Piano Duet. Classical Period. Advanced Intermediate. , , Sheet Music Single. Published by Sandra Zylstra (S0.17981). "Alla Turca" is part of Sonata in A, K 331 by Mozart. Enjoy playing this lively arrangement! (Approximately 4 minutes, 9 pages).About Digital Print Sheet MusicDigital Print is printable sheet music available anytime, anywhere. Just purchase, print and play! View your online sheet music at home, school, work or anywhere you have a computer connected to the Internet. Use our iPad app to view your digital sheet music on the go. With Digital Print, you can print your digital sheet music immediately after purchase, or wait until its convenient. And our software installation is easy - we'll guide you through the simple steps to make sure you have Adobe Flash Player, Adobe AIR and the Sheet Music Plus AIR application.